I told you I couldn’t help myself. I had to make myself a little care bear style bear! 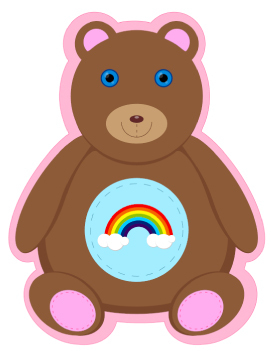 I combined the rainbow I made with the method detailed in my Create a Rainbow in Silhouette Studio tutorial with the teddy bear from Draw a Bear in Silhouette Studio video and the adorableness took over big time around here. I’ll release a teddy bear freebie later this week or early next week, but until then, if you’re interested in stretching your skills, you can definitely make your own.